This seminar will cover the bunkai and practical application of Kanku Dai (Kushanku) and Empi (Wanshu). The seminar is spread over 3 days. 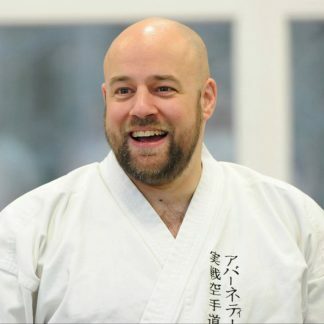 Iain Abernethy is the chief instructor of the World Combat Association and a 7th DAN in the British Combat Association. He is a renowned author of many self-defense articles, martial arts books and videos. He approaches kata in a holistic manner (each kata is a complete fighting system). The seminar is spread over 3 days. The number of participants is limited to 40 per day. For less than 10€ per hour you get to learn new insights in 2 of the common higher level kata in karate. So don’t hesitate and book your seat. If you book before May 1st, 2019 you only pay 65 € for the whole seminar. We accept all major creditcards.